"Can't you see that I love you? I'm your wife!" L'Enfer is a sizzling piece of cinema, filled with an almost unbearable intensity and unflinching vision of hell—hence the title. It starts with Paul Prieur (François Cluzet) building a resort hotel on the eve of his wedding to the ravishingly beautiful Nelly (Emmanuelle Béart). The two seem to have a perfect relationship, filled with love and plenty of success thanks to Paul's dedication to his work as the hotel manager. Years later we see that things are still going well, but their seemingly perfect family life starts to crumble as Paul becomes suspicious of Nelly's flirtatious behavior. Focusing in on her happenstance encounters with hotel hand Martineau (Marc Lavoine), Paul delves into psychological torment as he fantasizes about his wife's supposed infidelities. His grip on reality begins to slip, causing his business to suffer as he goes missing for hours and spies on his wife. It becomes quickly apparent to the audience that the movie, operating on a script written by Chabrol from a 1964 scenario by Henri-Georges Clouzot, is not interested in Nelly's sexual relations, but in her husband's obsession. Delving into the psyche of Paul, Chabrol paints a vivid and disturbing film that is likely to remain with its viewers well after its credits roll. I'm sure many viewers will catch on to the state of Paul's health well before the movie is over, since the direction wants us to become aware of and bear witness to his personal hell. Certain things that initially come across as clumsy filmmaking, such as abrupt cuts to black, take on an importance as the film enters into its closing minutes. I hesitate to say minutes, for the very fabric of time itself seems to disappear in a haze of obsession and unanswered questions. We as viewers are left in the same place as Paul, feeling a sense of despair and confusion. It's a remarkable feat for Chabrol that these feelings don't sour the viewing experience, for they don't exactly match up with one's usual idea of entertainment. At times Chabrol's direction is a bit heavy-handed—his symbolic images are fairly obvious and almost border on parody—but he tells this tale well. Featuring a fine cast, L'Enfer gives its leads ample room to manipulate the audience and play around with their talents. Emmanuelle Béart brings a strong sense of desperation and love to Nelly, allowing the audience the ability to see her not only through Paul's jealous eyes, but also as her own person. François Cluzet's turn as Paul is a tour de force. Devestating and enthralling, Cluzet presents a steady hand at the center of the film. The supporting cast adds a great dimension to the story also, though they are clearly less important than the leads and serve only to fuel Paul's obsession. Few films have the kind of focus of Claude Chabrol's dark L'Enfer. Stripped of all pretense, it takes the audience into the flames of hell with such passion and insight that Dante himself would be proud. Image Transfer Review: The anamorphic 1.66:1 widescreen transfer is a sufficient viewing experience, though it does have some print defects. The colors come across quite nicely, as do the blacks. Contrast is strong, helping to create an aesthetically pleasing experience. Audio Transfer Review: The Dolby Stereo 2.0 mix is fairly front heavy, but when played in ProLogic some rear channel activity juices up the mix. Sound separation helps to open up the mix, creating some dynamic range without calling attention to itself. Extras Review: Unlike the other installments in Kino's Claude Chabrol Collection, L'Enfer has an impressive collection of extras. Things get started with a scene-specific commentary by Chabrol, who gives extensive commentary on three lengthy scenes. His comments are quite well observed, though the English subtitles do occasionally have some typos. He explains the screenwriting process and his artistic designs with the movie quite eloquently, so this is a worthy listen. Continuing on the success of his commentary, the featurette Chabrol Discusses L'Enfer (11m:15s), goes into the different scenarios originally written by Henri-Georges Clouzot and Chabrol's approach to depicting time in the film. This is a fine companion piece to the commentary. The second featurette, A Presentation by Film Scholar Joel Magny (03m:07s) is a montage of still images from the film with Magny's voiceover narration giving a brief background on the movie's production process. Magny's comments are translated into English via subtitles, but his comments are fairly superficial and not particularly interesting. The original French trailer is also included in 1.66:1 widescreen and French audio, but no subtitles are included. There aren't a great many extras on this set, but Chabrol's comments are a nice addition. 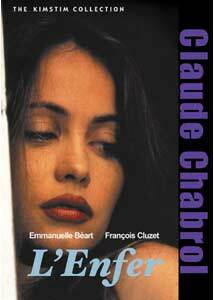 Compelling and unsettling, L'Enfer is Claude Chabrol at his best. The effective film receives a nice presentation on DVD thanks to Kino, with some worthwhile extras. Don't miss it!